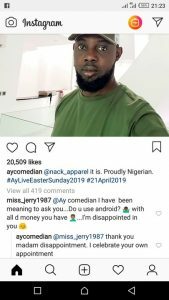 Comedian Ayo Mkun, popularly known as AY, posted his picture on his Instagram page and a fan asked if the comedian was using an android phone and if the answer was yes, then she was disappointed in him. 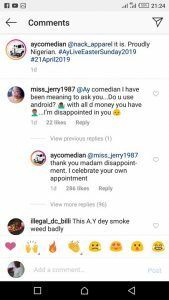 The troll said she wonders, why would the comedian with his affluence be using an android phone. AY, however replied the woman with, “Thank you madam disappointment. I celebrate your own appointment.